I bought a ginger plant today! I heard rumors about growing ginger in Pennsylvania, but I've never seen the plants in person. This little guy came from a local farm that usually sells ginger root at the end of the summer. 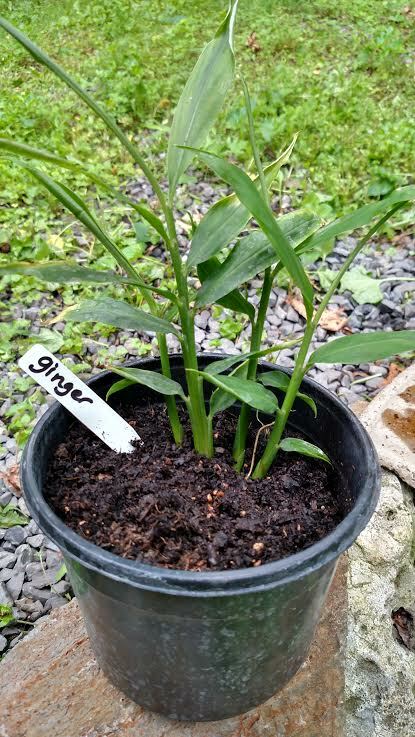 This is the first year they've had enough extra rhizomes to offer ginger plants for sale, so I had to snap one up. The vendor said that ginger should be grown like potatoes: plant the ginger, then mound more earth up around the stems to encourage the growth of new rhizomes. She also mentioned that the leaves and stems are edible, with a mild ginger flavor and spicy aroma. Our soil is pretty thick with clay, so I'll lay down a base layer of sand in a hole before planting. This should help with drainage - it's worked very well with our blueberry bush. Where in PA are you located? I'm southcentral. Can I grow ginger outside? Can it be grown inside in a pot? Thanks!